Reviews are part of static testing, where tester are required to check/verify the documents like test case, RTM, test plan etc. Walk Through : Not a formal process, led by author generally done for higher level document requirement Specification etc. Informal Review : documents are prepared and checked thoroughly by the reviewers before the meeting & It involves peers to examine the product Formal/Technical Review : Done by the development team to technically verify the documents. The Moderator : Review lead by moderator & his role is to determine the type of review, approach and the composition of review team. The Author : As the writer of the ‘document under review’, the author’s basic goal should be to learn as much as possible with regard to improving the quality of the document. The Scribe/Recorder : he is responsible to record the bulletined points in review along with defect, feedback & suggestions. The reviewer : The role of the reviewers is to check defects and further improvements in accordance to the business specifications, standards and domain knowledge. What are different phases of formal review? Note : In Some organization informal review is termed as Peer Review, where review is done inside the team by team member & generally it is done without any documentation. > Major functionalities are covered in test cases with high priority. > GUI featured are covered properly. > Test case document follow the organization approved document format & structure. > Test steps are suitable to achieve the objective/Scenario. 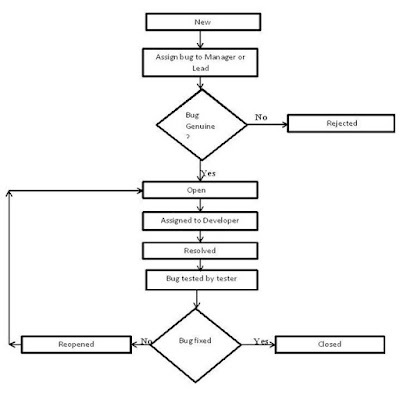 This cycle explain the life of a bug/defect which was found during testing. Defect Found : Potential defect that is raised and yet to be validated. a: Rejected : If this is not a bug &; it is FAD (Functioning as designed) also it will be closed. b: Open : Bug can be replicated successfully. Assigned : If Bug is valid then it will be assigned to associative developer & status of bug will be assigned. Fixed : Associated devfeloper will work on it & fix it and after that status will be fixed. a : Verified/Closed : If bug is fixed then tester will pass it & status will become passed & bug will be closed. b : RE-OPEN : If bug is still exist & test is able to replicate it then bug will be failed by tester & its status will become Assign. END : Bug life cycle will end here and document will be updated with build number i.e Build x1.0 has four bugs & they are fixed. Deffered : if bug is valid and it will be fixed in next further Iteration/Release then it will be marked with status deffered. Deployed to QA : Bug has been fixed & deployed to QA environment & waiting for tester to Re-test it. Ready to Release : Now bug is passed by tester & build is ready to release with fixed bug. What is severity & priority ? Severity : It defines the impact that a given defect has on system in other word "How much bug is serious with respect to the functionality." Priority : Priority defines the order in which bug/defect should be resolved. should we fix it now or can it wait? Priority Types : Low, Medium & High. Master data can not be created when user click on "Create" button application get crashed. An error on basic functionality, which prevent user to use the application. A job can be done by n number of ways but out of n , one is not working also this is not much more used by users. There is no validation message for wrong input although at last application will not submit the data. What is Software Testing ??? What is Test Cases ? How much negative test cases should write? Bug life cycle in software testing? what is severity & priority? Example of high severity and high priority ? Example of high severity and low priority?